Is there a better alternative to Validator? Is Validator really the best app in HTML category? Will Validator work good on macOS 10.13.4? Validator... Much has been made about standards compliance in modern Web browsers. Less is made about the responsibity Web authors have to deliver correct mark-up to these programs. Some HTML authors champion one browser over another for its standards support when they themselves do little or nothing to assure their mark-up is correct. Unfortunately, most validation tools operate on one file at a time through a Web or editor interface. This makes checking large numbers of files in a production environment tedious and impractical. 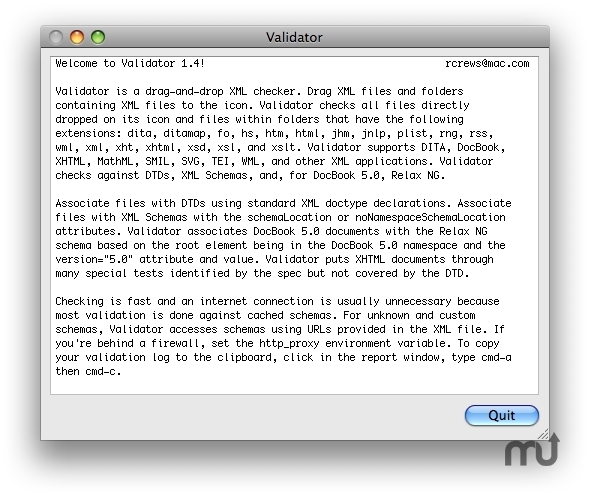 Validator easily checks one file or a thousand. It efficiently assures all your XML is ready for your workflow.